In this article we will describe how to make a marshmallow roaster, powered by the sun. It can be made from readily available materials, and while it is probably a little safer than the traditional method of roasting marshmallows (over a campfire), it can still start fires, and should be used only by those you would trust with a box of matches. Like most of the projects in this book, it is not just a fun toy, but a toy that teaches important scientific principles. A page magnifier. More technically known as a Fresnel lens (pronounced freh-nell), this is a piece of plastic almost the size of a notebook page (7 inces by 10 inches) that is used to magnify a page of a book to make it easier to read. These are available in drug and stationery stores, and also at scitoys.com. A small cardboard box. The actual size will depend on the focal length of the magnifier. 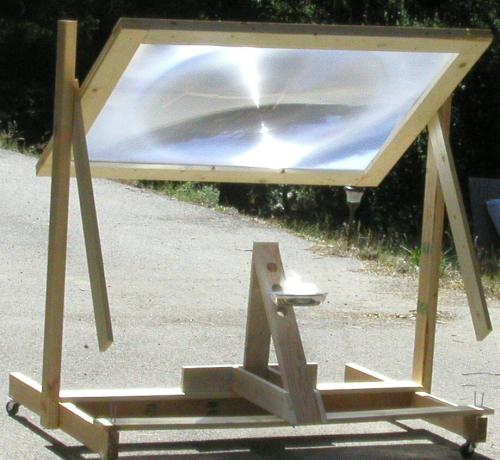 The magnifier we use focuses the sun to a small bright dot at a point 10 and a half inches from the lens. This means that a box 10 inches on a side would be perfect. 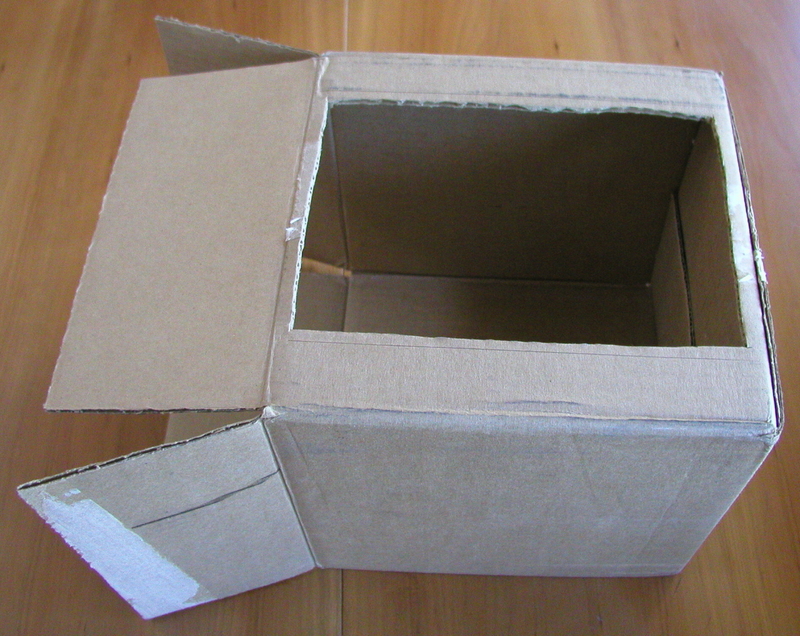 The actual dimensions are not critical, as we will discuss ways to adjust for large or small boxes. A package of bamboo skewers to hold the marshmallows. You can also use coat-hanger wire, or long fondue forks. 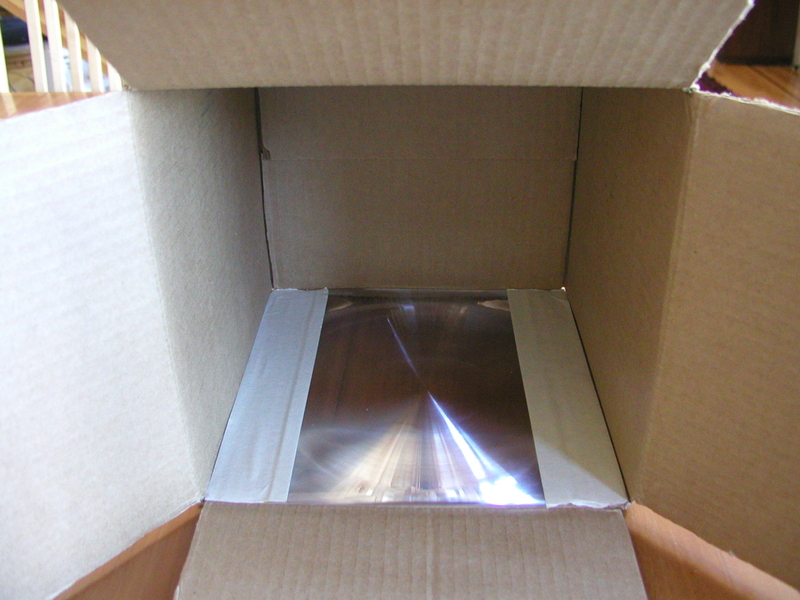 The first step is to cut a hole in the box just 1/4 inch smaller on each edge than the Fresnel lens. Then we tape the lens to the inside of the box. The lens has a smooth side and a grooved side. 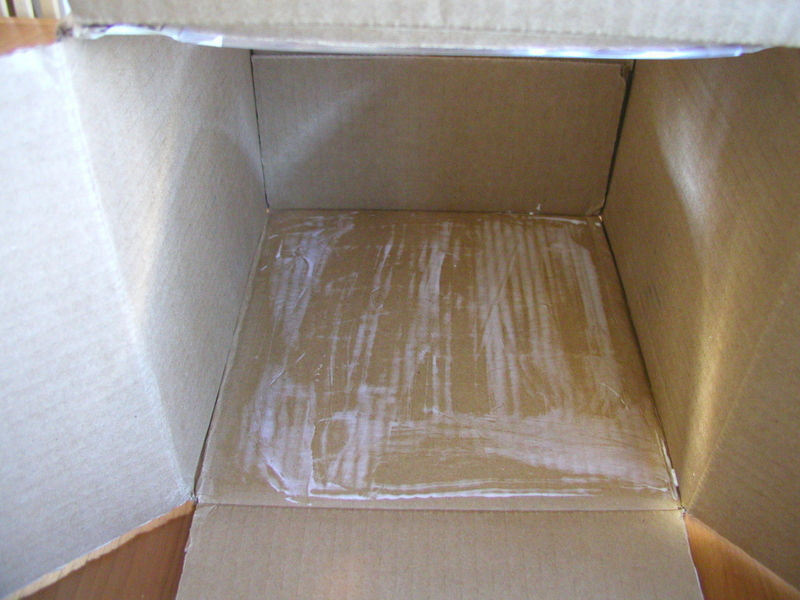 The grooved side should be facing out, away from the inside of the box. Next, we glue aluminum foil to the inside of the box, on all sides except the side that has the lens. 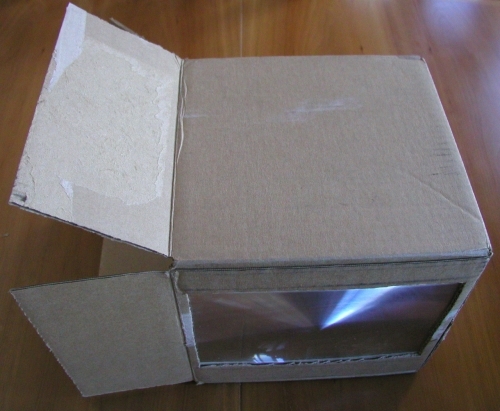 This is to make sure that if the box is accidentally left in the sun, the lens will reflect off of the shiny aluminum, and not burn a hole in the cardboard. 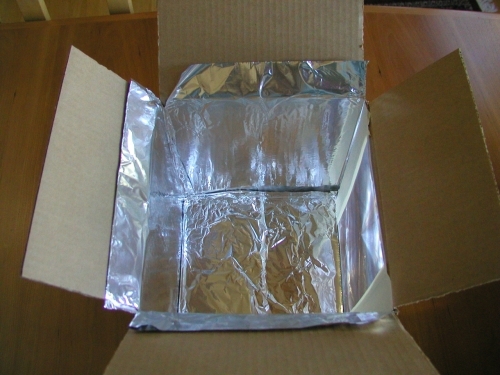 The foil should be shiny side out, and it does not matter if it is wrinkled. on the side of the box opposite the lens, we now cut a square hole, about twice the size of a marshmallow. On either side of the hole, we cut small triangular tabs to hold the skewer. These tabs are bent outward, and the skewer rests on them. The photo above shows the results of a somewhat overzealous approach to marshmallow roasting. While the outside maybe quite overdone, you can see from the drooping position of the result on the skewer, the inside is a warm creamy delight. The bright sunlight, concentrated on the highly reflective white marshmallow, is difficult to look at. Welding goggles, an inexpensive item at most hardware stores, adds an extra level of excitement and awe to the participants. Very dark glasses (or two pair of dark glasses), or solar eclipse viewing glasses, also work well. A light coating of chocolate syrup or cocoa powder helps the marshmallow absorb the sunlight instead of reflecting it. This speeds up the roasting process, and reduces the glare on the eyes. Some kids like their marshmallows "well done" and first burn a small black hole in the marshmallow by holding it at the exact focus of the lens, and then expand the black spot by moving away from the focus a little bit. The black spot absorbs the sunlight very well, and the marshmallow cooks quickly. This roaster can also be used for vienna sausages, or bite-size pieces of hot dog. A flat plate of glass does not magnify. To magnify an image, the glass must have a curved shape, like a magnifying glass does. The name "lens" comes from the Latin word for the lentil, a seed which has a shape of a disk whose top and bottom surfaces curve outward. 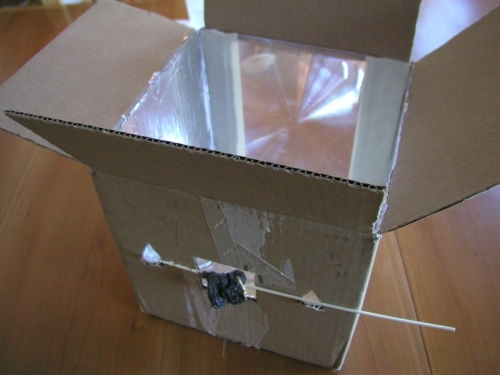 But the Fresnel lens we used in the marshmallow roaster appears to be flat. This is because a special trick is used to make a flat magnifier. Remember that we said a flat plate of glass does not magnify. Inside a normal lens, we can draw many rectangular areas. These areas are glass, but since they have flat edges, they do not help the lens magnify. So they are not useful for the purpose of a magnifier, and simply add unnecessary weight and cost to the lens. The second part of the drawing below shows what is left if we remove the useless parts, and only keep the parts of the lens that magnify. One side of our resulting "lens" is flat. But the other side has ridges with curved sides. These curved pieces of glass (or plastic in our Fresnel lens) bend the light in the same way as the original lens did. 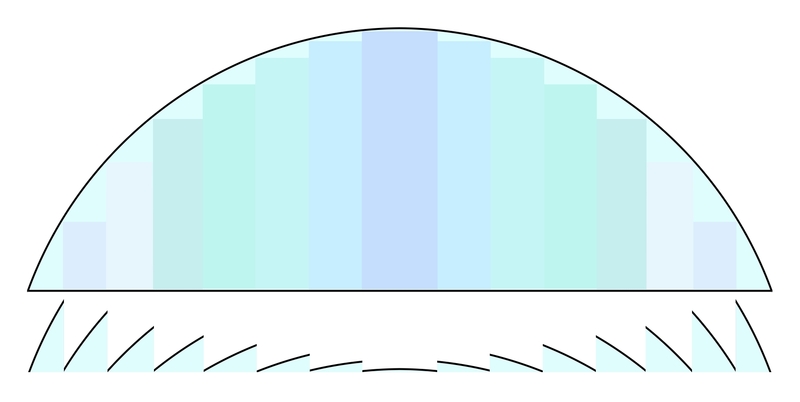 This discussion of how Fresnel lenses work is actually a simplification of what is really going on. We will explain in more detail later. If you rub the Fresnel lens with your fingers, you can feel these ridges. Concentrating the sunlight is only half of what is going on in the roaster. The other half is what happens when the light hits the marshmallow. The marshmallow is white. It reflects almost all of the light that hits it. Only a small fraction of the light is absorbed. 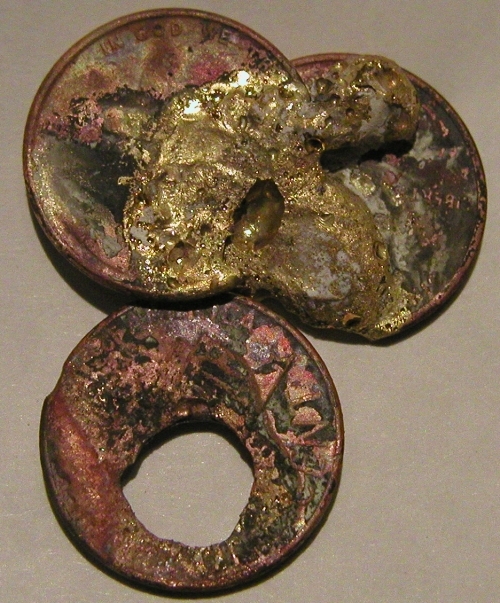 When light is absorbed by a material, it is not lost. The energy from the light moves the molecules of the marshmallow. Moving molecules is what we feel as heat. In order to heat up the marshmallow, we had to use the very smallest dot of light from the lens, where all of the sunlight is concentrated into one tiny spot. The small fraction of the light that the marshmallow absorbs is now enough to heat up the marshmallow until it burns at that spot. But now the burned part of the marshmallow is no longer white. It no longer reflects very much light. That is why it appears black. Black objects are those that absorb much more light than they reflect. Now that the spot is absorbing most of the sunlight, it gets hot very quickly. If we don't move the marshmallow, it will catch fire. We move the marshmallow closer to the lens, so the circle of light from the lens is bigger, and thus less concentrated. 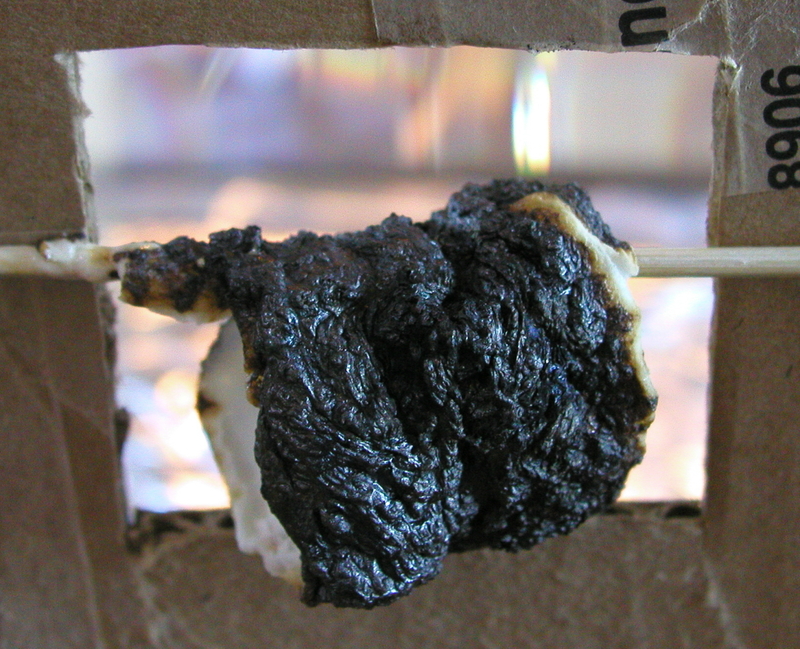 It is still concentrated enough to roast the black spot on the marshmallow, and make it bigger. By coating the marshmallow with a dark substance, like chocolate syrup or cocoa, we can speed up the heating of the marshmallow. 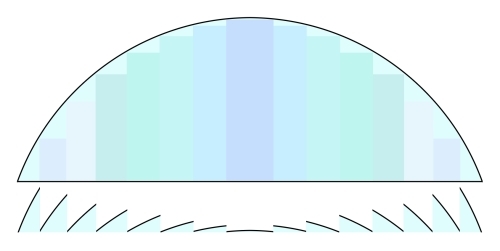 Our discussion about how Fresnel lenses work, we gave the standard textbook explanation, which explains the concept, but misses some details that are important if you want to do real work with the lens. In the simplified example, we simply moved the curved pieces down to lie flat. But a curve that is designed to focus light onto a point depends on the middle of the lens being farther away from the focal point than the edge. If we simply moved the pieces down, they would not focus the light to a point. The edges would focus the light to the same point as before, but as we move to the center of the lens, the focal point moves farther away, by the same amount that we moved the pieces down. Real Fresnel lenses compensate for this. The curves are made to keep the focus at the same point, regardless of how close to the center of the lens a light ray is. Fresnel lenses are usually flat on one side. The corrections made to keep the focus at a point only work from one direction. The lenses are most commonly made to focus light in such a way that the grooved side must face the sun, and the flat side must face the focal point. If the lens is reversed, it will not focus to a sharp point. The edges will focus too close, and the center will focus too far away. This is why we said to make sure the grooved side of the lens faced outside the box (towards the sun).